GEYER (Guyar, Guyer), GEORGE, governor of York Fort, Hudson Bay; fl. c. 1672–97. Outside his career in the HBC, which began in 1672 when he became associated with Governor Charles Bayly “in a constant Discovery . . . yea, in very dangerous Places” (Parl. Rept., 1749, p.273), nothing is known of George Geyer. He was to have returned to England from James Bay in 1680, but the wreck of the Prudent Mary that year delayed his arrival in London until 1681. Geyer, under contract for three years and with instructions to obtain isinglass at Slude (now Eastmain) River, sailed to James Bay in 1682 but, after wintering as chief at Rupert River, he again went to London in 1683. His early return may have been caused by Governor John Nixon’s inability, or lack of enthusiasm, to undertake the isinglass project. But Geyer’s services were retained for, after spending the winter of 1683–84 looking after an Indian who had been brought to London at the Company’s expense, he sailed for Port Nelson in 1684. Geyer had been appointed a member of Governor John Abraham’s council as well as chief of the fort to be established at New Severn, but this new settlement could not be formed immediately as help was needed at Port Nelson against the French who had not altogether lost the advantages they had gained there in 1682. Geyer therefore remained at Port Nelson, taking part in repulsing the attack made by Claude de Bermen* de La Martinière in September 1684, and supervising the building of the first York Fort on the north bank of Hayes River. After the French withdrawal in 1685 he was able to establish New Severn. In 1686 Geyer became governor of York Fort. This was the year in which resources there were severely strained by the addition to the normal personnel not only of the men from the wrecked supply ship Happy Return, but also of Governor Henry Sergeant and the other released prisoners from the Company’s forts in James Bay which had been captured by the Chevalier de Troyes. In 1688 Geyer’s dignity as governor was confirmed by a commission from James II, and in 1689, the year which saw the start of war between England and France, this was replaced by one from William and Mary. 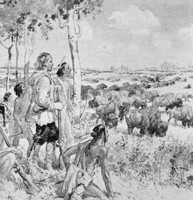 In 1690 Geyer successfully repulsed a French attack on York Fort, and in 1693, when he could not be induced to stay any longer in Hudson Bay, Thomas Walsh took over as governor and he finally returned to England. It was during Geyer’s period as governor that the first attempt was made to settle at Churchill River (in 1689) and that Henry Kelsey* went “up into the Country of the Assinae Poets” (in 1690). Geyer applied for re-entry into the Company in 1697 but there was no suitable opening for him at that time, and no further references to him have been found in the Company’s archives. Alice M. Johnson, “GEYER, GEORGE,” in Dictionary of Canadian Biography, vol. 1, University of Toronto/Université Laval, 2003–, accessed April 25, 2019, http://www.biographi.ca/en/bio/geyer_george_1E.html.